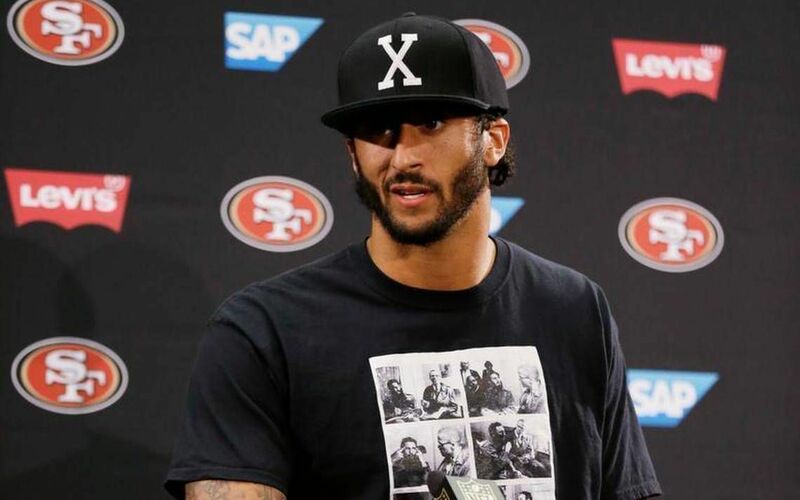 Colin Kaepernick wearing Castro shirt. It’s appropriate that NFL training camps across the country open this week. Despite the growing body of evidence that the sport turns the brains of many of its participants into complete mush, the NFL has a cult-like following that draws from every demographic. The total revenue generated by the NFL surpassed $13 billion last season, and it’s been projected already that our unwavering love for the sport will push the revenue into the $14 billion range following the 2017-18 season. How unifying is it? The same person who slings a noose over a tree in south Philadelphia could be sitting next to a Black Lives Matter activist at Lincoln Financial Field this fall, and if Carson Wentz throws a game-winning touchdown to beat the Dallas Cowboys the two would likely high five and hug each other like long lost brothers, oblivious to their differences, united in a cause. But as authentic as our passions are about the NFL, the sagas of OJ Simpson and Colin Kaepernick illuminate the continued unwillingness of the nation to have an honest conversation about race, so much so that the basic truth gets altered right before our eyes. Last week, Simpson — in his prime arguably the greatest running back in history — won his parole after nine years for his role in a Las Vegas hoist of sports memorabilia. As a result, he’s scheduled to be a free man in October. The charges were always trumped up – Simpson didn’t draw a gun – and the parole board decided that the sentence of up to 33 years behind bars was ludicrous. Simpson has been a model prisoner during his time in jail for a crime that most think he should have spent maybe three years behind bars for. But those who think he got away with murder have always felt that this sentence was a makeup call for the botched murder case. They wanted to look past the fact that racist detective Mark Fuhrman perjured himself by lying about his excessive use of the N-word. Newsflash: A liar as your star witness in the “trial of the century” will ruin any case. They want to disregard the Keystone Cops-like performance of the LA County Coroner’s office which completely botched the labeling of urine and bile samples taken from the victims. Nevertheless, their irrational angst is understandable. American justice continues to be more overseer, mitigating the relationship between Blacks and whites, and less Justitia, the blindfolded Roman goddess balancing the scales of justice and impartially meting it out. Were she capable of opening her eyes, she could read the 2014 findings of the ACLU that sentences imposed on Black males in the federal system are nearly 20 percent longer than those imposed on their white counterparts convicted of similar crimes. Or that the racial disparities in the system result from disparate treatment of Blacks at every stage of the criminal justice system, including stops and searches, arrests, prosecutions and plea negotiations, trials and sentencing. How in God’s name could a Black man, the thinking goes, despite the abject bumbling of the prosecution, walk free when a White woman and her pal have had their throats slit? This is representative of the train running off the rails. Kaepernick is the quarterback who led the San Francisco 49ers to the Super bowl in 2013 and was subsequently awarded a contract worth $126 million in 2014. Following a summer in which two Baton Rouge police officers pinned down Alton Sterling and shot him to death, and later Philando Castile was shot in his car in front of his daughter and girlfriend by a Minneapolis, St. Paul police officer, Kaepernick decided he had seen enough and started kneeling during the playing of the National Anthem. Kaepernick, released after last season and unable to get a job, made it clear that his stance was against these barbaric shootings and the disproportionate manner in which they continue to be perpetrated against Blacks. He didn’t equivocate; he never mentioned the military, yet somehow this was transformed from what it was into an attack on the armed forces. However, the Tribune’s mistake was unintentional; the paper was only trying to be first with the news. But make no mistake about it, this twisted prism of bigotry through which Simpson and Kaepernick are seen is very intentional and institutional. After all, it’s much easier to create a boogeyman and get past it than it is to deal with that 400-year-old, 800-pound gorilla. John N. Mitchell has worked as a journalist for more than a quarter century. He can be reached atjmitchell@phillytrib.com and Tweet at @freejohnmitchel.